why not HIJACK NEWS ARTICLES to place your STUPID WEB LINKS TO DATING SITES!!! 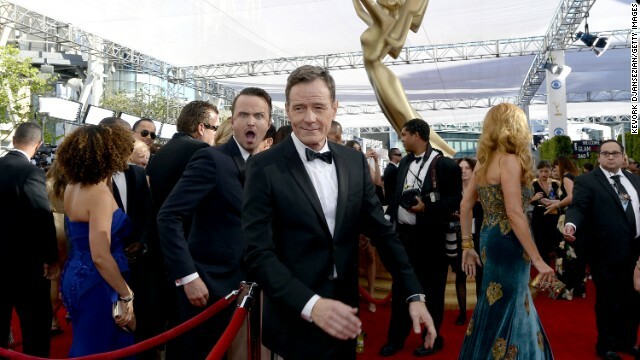 Did anyone else notice the great photo bomb by Aaron Paul?? Hilarious! did anyone notice the one in person this week. Troll, if you're going to pirate my blog name, at least post something rude, offensive or disgusting. You could always post a picture of your mother. Beware of D.Ware football is great. Happy Thanksgiving to Mich. Ya know? Much love everybody. saying hi to ur friend peace. crack? I do not understand your question. Re: "peace" and "crack". I was simply saying happy thanksgiving. Please elaborate. Ignore that idiot. It's one of the nuisance trolls that occasionally pollute the blog with their off topic, insider nonsense. Just report abuse on them and help keep the blog clean of their crap. Eh-maybe if you look at a pic of ur mama you'll get the definition. I hear your sister lives under a bridge and eats passing billy goats. MGK=charlie crack. Understand now? We know who you are.